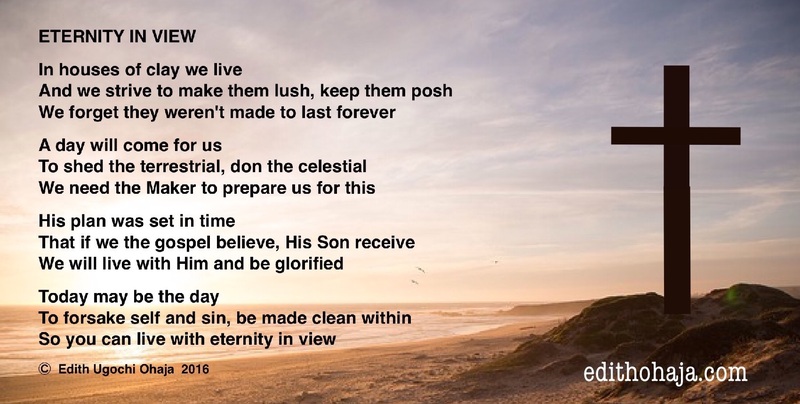 This poem attacks our over investment in that which is temporary to the detriment of the eternal. If you haven’t done so, begin to make plans for eternity now by reconciling with your Maker, through His Son, Jesus. His blood shed on the cross of Calvary will wash away your sins and His word will continuously renew your mind while His Spirit will live in you to enable you live in line with His precepts as revealed in the Bible. Then when it’s time to leave this mortal plane, you won’t be scared or full of regrets. May you be richly blessed as you do this in Jesus’ name. 51. Behold, I shew you a mystery; We shall not all sleep, but we shall all be changed, 52. In a moment, in the twinkling of an eye, at the last trump: for the trumpet shall sound, and the dead shall be raised incorruptible, and we shall be changed. 53. For this corruptible must put on incorruption, and this mortal must put on immortality. I am inspired by your words of wisdom and now knowledgeable about the word of God.I am so proud to call you my aunt; a wise , beautiful, african woman. YOU TRULY INSPIRE ME TO BE BETTER.I'M YOUR NUMBER ONE FAN.THANK YOU MA. May God help me to do his wish...Amen. Poem is just cool and the graphic has this melting words on its...i love it. All praise to God and a big "Amen" to your prayer! The bible verse in Matthew 16: 26, "What good will it be for someone to gain the whole world, yet forfeit their soul?" comes to mind. We all should ponder on that daily. Bless you for such a reminder. That's a great scripture, Nedu! Thanks for sharing it and remain blessed. a well spent life is life spent following christ not following worldly things. ma i admire you a lot . Glory to God and bless you, my dear! Thanks a lot ma for the reminder. Some of us live our lives as if we are the owners our lives, we are not. After living here on earth we shall give an account to God on how a we spent our lives which will determine where we should spend our eternity. I pray to make heaven on the last day. My prayers everyday is to be with Jesus in his throne,To live with eternity in view is to suffer for His name's sake. To live with eternity in view entails living our lives in accordance with the will of God, To live with eternity in view implies that we focus our minds on things above not on earthly wealth, To live with eternity in view is to think about heaven, talk about heaven, teach about heaven, preach about heaven and live to make heaven. God help me to make it. i want to be where you are. This is our temporary home, we have a permanent home beyond the skies and we should live each day like it is our last. Eternity is the priority. Sometimes, our minds dwell too much on the things of this world. May God help our souls. Truly, no one desires hell. But often times, we are too inclined to solving our immediate needs. May God keep us in his grace to never lose sight of ETERNITY. Eternity is our everlasting destination. Of what use is it if we gain everything down here and lose all up there. I don't dream for that. I dream for heavenly eternity and not otherwise. A nice one. Eternity should always be our watchword. We should never be engrossed in the world as to loose sight of eternity. We Christians of today need constant reminders like this one. Of how we should be more concerned about where we will go from here than the little time we will spend here on earth. BRING IT ON! JEHOVAH CAN TAKE IT!